He had the opportunity to address the Eurovision TV Summit in Lucerne, Switzerland on 6th May 2009. 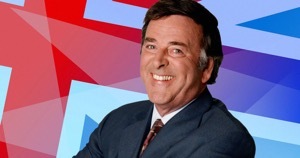 He recalled fondly the television show that has been so long associated with, starting with the 1971 contest in Dublin, to his final commentary for the BBC in Belgrade, Serbia in 2008. Here are some of the highlights of his speech to those who were present. Although sometimes he might get his facts and figures mixed up, “ I remember a night, I think it was Malmo, Sweden, [it was actually Lausanne, Switzerland] when an elaborate routine that took ten minutes to set up, and was supposed to culminate, as in the legend of William Tell, with an arrow piercing an apple on a young boy's head, culminated instead, after all the preparation and the flashing lights, with the arrow missing the apple…”. He nevertheless continued to show an affection for the programme , “And if only I could remember half the foolishness…And you ask me if I love the Eurovision? How could I not ? 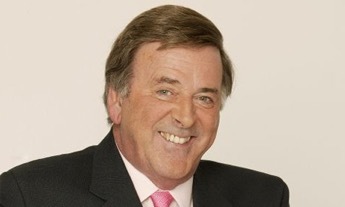 It wasn’t just the main contest that came in for some remarks from Sir Terry. “As to interval acts, could I make a plea on behalf of all radio commentators ? Could you make sure that they’re musical? Trying to commentate for fifteen minutes, on Mime acts, jugglers or clowns or any kind of silent performance, that the listeners can’t see, is not easy, to say the least, and usually results in the radio commentator handing back to his home network for a selection of Eurosong hits…"
On the positive side he went on “It’s what the Eurovision Song Contest is about: fun. It’s Light Entertainment, the biggest of its kind anywhere in the world, and certainly over the last few years, the most brilliantly produced three and a half hours of live television ever seen…. It’s great to celebrate when your country’s song wins. Just remember, the following day, every other country has forgotten about it. It’s a marvellous, colourful occasion, but it’s a one-night wonder, like all television programmes”.